Pragya straddles the research & advocacy and project implementation worlds in the development sector, and has a proven track record of successfully implementing large projects with multilateral and governmental partners, for the development of less developed areas and peoples. Pragya undertakes implementation of grassroots projects, independently or in collaboration with other organisations. These projects seek to serve especially deprived and neglected communities and regions across the world. Pragya has a diverse portfolio and undertakes action on multiple sectors including Rights & Advocacy, Education, Gender, Health & Sanitation, Biodiversity & Natural Resource Management, Culture Preservation, Renewable Energy, Enterprise Development. New, innovative methods and technologies are used to provide services to target areas and the local government and civil society are catalysed for effective action. We provide a range of support services to the communities we work with in remote and less-developed regions. Farmers are helped with technical inputs and helped to access financial assistance available through government programs. Enterprises are assisted with management support and linkages with banks and other financial institutions, as well as with buyers and markets. Youth are assisted with vocational and career guidance and information. Pragya undertakes studies on issues that constrain development, particularly for the remote and difficult areas. This work stream seeks to enhance understanding of critical developmental issues among policy-makers and development workers, towards catalysing suitable policies and interventions. Advocacy efforts take the forms of seminars, publications and presentations, as well as networking and dialogues among development actors. Pragya operates research and extension program for developing and implementing improved technologies to address area-specific problems. The program seeks to make research and technology development more responsive, accessible and relevant to the needs of the poor. In particular, technologies and methods for making available the goods and services of development, in remote, isolated regions/communities, are the focus. Infusion of these technologies is facilitated through: pilot projects, training potential users, and promotion of the technologies among key constituencies in the specific areas. Pragya undertakes commissioned studies and interventions that help the state and development organisations to enable development in disadvantaged regions and backward sectors. 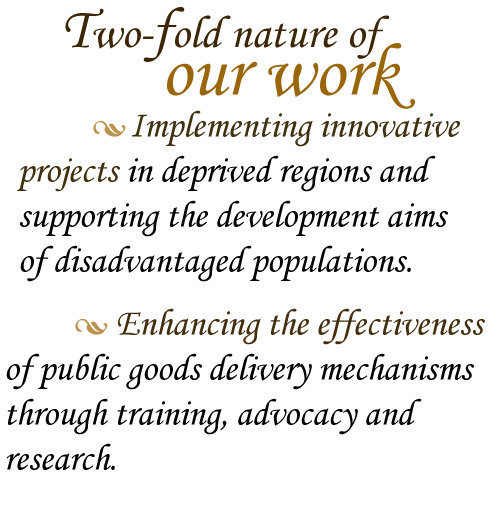 Activities include: feasibility studies and sensitivity analysis for programs; project monitoring and evaluations; sectoral analysis and development of program plans; development of toolkits, prototypes and protocols; facilitating development interventions and building capacity.